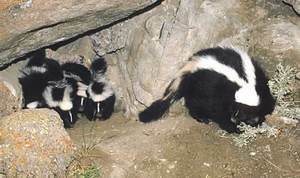 West Linn Skunk Removal can solve your skunk problem and remove any odor left behind. There are different methods for removing skunks, but we have found that the most successful method is to live trap and remove from the property. This ensure the problem is solved, but then you must make sure that the areas they were getting in are sealed from future. This includes areas that have not been used, but could be in the future. Skunk's are very good diggers and that makes sealing house, buildings, and decks a difficult process, but we have been doing it for many years. During the spring and summer months in West Linn, Oregon skunks will have babies and that can create a a greater risk of getting sprayed. The mother is a lot more defensive and the babies are not able to control there spray very well yet. When the babies get older you will often times see them walking around outside at dusk. You should never approach as skunk even a young one. For West Linn Skunk Control and Removal Call 503-201-2432!